Sudoku is a well known puzzle with lots of implementations on various systems. The game appeared in French newspapers around 1890 for the first time in a similar form. According to Wikipedia, the modern Sudoku might have been invented by Howard Garns in 1979. The Android app creates Sudoku problems with a unique solution, and lets the user solve these problems, using an easy to use and helpful interface. 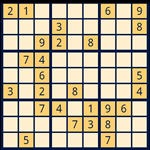 Moreover, the user can enter Sudoku problems, and use the program to solve these problems. Problems can be imported and exported via the clipboard in a standard text format. Sudoku is a free app available in the Android market.